Costs – How much do you think tree removal, maintenance or stump costs in Bridgeport? Here are the averages for you to compare against what professionals quote you. FAQs – Learn more about the rules and regulations of Bridgeport when it comes to trees, along with trees you should or should not plant depending on the weather and current pests. Services – Need to know more about the “tree scene” in Bridgeport? We have the list of professionals who work in your area. How Much Do Tree Services Cost in Bridgeport? How much do tree services in Bridgeport, Connecticut cost? The answer to this question depends primarily on the type of service required, the project’s hazards and the amount of labor time it takes. How Much Does Tree Removal & Maintenance Cost? Residents of Bridgeport, Connecticut can expect to pay on average nearly $1,000 for tree and shrub removal. Routine maintenance like tree trimming, pruning and cutting services are more affordable, ranging from almost $400 to $580 nationally. Stump removal in Bridgeport will run residents between $400 and $450. The cost of stump removal varies depending on its width and whether residents opt to have it ground down or completely removed and taken away. If the stump is in a central location in the yard, it might be better to have it removed completely rather than ground down, but sometimes if it’s ground down far enough, it won’t get in the way of a lawn mower or affect the landscape. The physical demands and inherent hazards of a job play a key role in pricing. Very robust or tall trees like oak and pine make a job more costly. Tree location is also critical. Poor access due to items like fences and septic tanks make service take longer, with predictable effects on the price. Additionally, dead trees, hollow trees and those located near power lines pose inherent hazards that will cost property owners more on a tree services bill. However, it does not cost nearly as much to remove a tree that has already fallen over. If you need emergency work done during inclement weather or at night, there will likely be additional fees. Other company-specific factors are relevant, too. These include the experience, equipment and professional liability coverage of the tree service firm or contractor. Bonded and certified arborists usually have higher labor costs than their under-covered counterparts. For tree removal service, removing the remaining stump may be included or cost extra. This is also true of the travel expenses required to get to the job site and haul away refuse. Check the cost estimate provided by your tree service contractor for line items included in the base price. The tree canopy of Bridgeport, Connecticut is a prized public asset, enhancing property values and beautifying neighborhoods from North End to the coastal south side. For several years, Bridgeport has been dubbed “Tree City USA” for its stalwart commitment to urban forestry management. Additionally, Connecticut’s renowned state tree is abundantly found around Bridgeport. The white oak or charter oak is a revered species that can live for many centuries. As one of the continent’s oldest hardwoods, the white oak can grow as high as 85 feet. Among Bridgeport trees, European beeches have the widest spread, exceeding 100 feet. The tallest trees in the area tend to be pines, oaks, sycamores and the honeydew-making tulip tree. Bridgeport’s tallest tree is a 130-foot-tall Tulip Tree. Tall trees are often the most difficult to maintain, particularly when poor weather strikes. 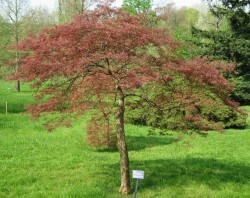 Shorter, lower-maintenance alternatives include the winged sumac, Japanese maple, star magnolia and fringe tree. Public and private trees in Bridgeport are regulated by the Director of Parks and Recreation, who doubles as the city Tree Warden. If a tree removal is in order, the Warden has the final say on rules enforcement. To avoid unwanted tree removals, residents should adhere to city codes. Tree-planting on a public street is not allowed without a permit. You cannot plant a tree in the space between the street curb and the sidewalk unless there is at least four feet of space. Trees cannot extend into the road or pedestrian walkways in a way that obstructs foot or vehicle traffic. They should not be planted by streetlights so as to obstruct their illumination. Planting in or near a tidal wetland or watercourse requires a permit with Bridgeport’s inland wetlands commission. Additionally, residents should avoid planting trees directly beneath or next to power lines. For trees within 20 feet of power lines, shorter ones are ideal. Low-growing species under 20 to 25 feet, such as crab apple trees and the eastern redbud, are best for this purpose. As a tree grows, regular pruning may be necessary to keep it up to code. Late winter is a good time to take up this chore with evergreens. For deciduous trees like oaks and beeches, the best time is February or March as winter fades into spring. Of course, property owners in Bridgeport also need to service any hazardous, overgrown or dead trees. The City considers stump roots, “obnoxious growth,” dead trees and dying limbs nuisances that must be removed in a timely fashion. 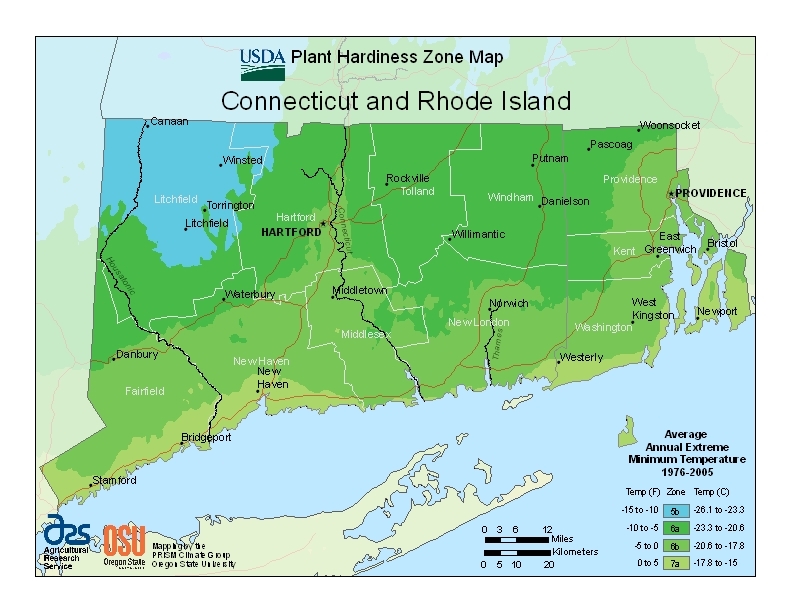 Bridgeport is part of USDA Hardiness Zone 6b. Its coastal climate is strongly influenced by the humid, subtropical weather of Long Island Sound, similar to New York City. 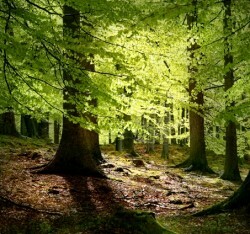 This means that trees must be able to survive the winter chill and summer humidity. Hardy urban-friendly trees such as green ash, red oak and black chokeberry thrive here. The empress tree and multi-trunked river birch are among the most versatile and resilient species around. Trees grown closer to Long Island Sound benefit from a warmer environment, longer growing season and less frosty winters. The climate is conducive to unique shoreline varieties like the American Holly and cold-resistant sweetgum trees. Although Bridgeport isn’t known for its fruit trees, you can grow certain varieties. The city’s proximity to the Sound makes it amenable to cold-hardy crab apples, persimmons, paw-paws and certain types of peach trees. While citrus fruit doesn’t usually thrive here, sweet or sour cherry, pear, plum and fig trees can often be cultivated. Of course, some trees are vulnerable to disease. Ash trees, for instance, suffer the ravages of the emerald ash borer. This invasive, tree-killing beetle has been spotted in Fairfield County and is often treated with insecticide.